SS: the month-long planetary alignment continues near xena the priestess planet as well as the incoming mega-comet see the starmap below .. this alignment is leading up to a month long mega-eclipse next month that will begin with a solar eclipse on 01 june 2011 . PLANETARY TRIANGLE: Another day, another alignment of planets. 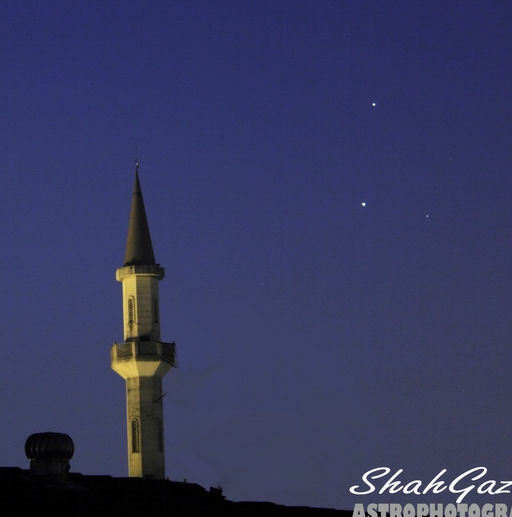 “This morning, May 14th, the ‘planetary triangle’ created by Venus, Jupiter and Mercury adorned the eastern sky behind my nearby mosque,” reports Shahrin Ahmad, who snapped this picture from his rooftop observatory of Sri Damansara, Malaysia: “I was lucky to have a clear sky today during the hazy season in Kuala Lumpur,” Ahmad. (As daily readers know, we predicted that May 14th would be a lucky day–another accurate forecast from spaceweather.com.) This planetary triangle is part of the Great Morning Sky Show of May 2011. Every day this month begins with a shape-shifting arrangement of bright planets in the eastern sky. One day it’s a line, then a trapezoid, then a triangle. What will tomorrow’s geometry be? To find out, set your alarm for dawn. The Maya made daytime observations of Venus. Venus had a psychological effect upon the Maya and other Mesoamerican cultures, it has been shown that the Maya were timing some of their wars based on the stationary points of Venus and Jupiter.